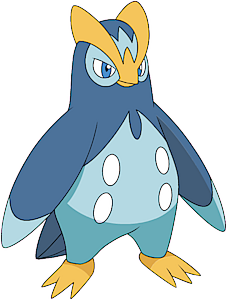 Prinplup in game: 225 Who? Important notice! Pokemon Prinplup is a fictional character of humans. 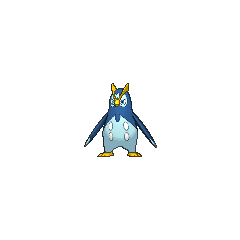 Prinplup (Japanese: ????? Pottaishi) is a Water-type Pokémon introduced in Generation IV. 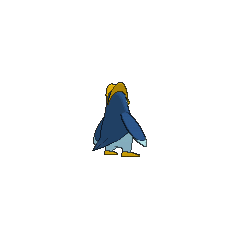 Prinplup appeared in Getting the Pre-Contest Titters under the ownership of Kenny. In the following episode, it battled against Dawn's Piplup. It was later shown to have evolved by the Sinnoh Grand Festival. In Dawn Of A New Era!, three young Trainers stopped by with their starter Pokémon. However, the girl that was in this group had a Prinplup. 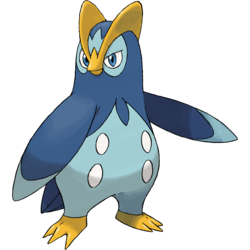 Platinum had a Prinplup after her Piplup evolved in Eterna City. She has since evolved into an Empoleon. 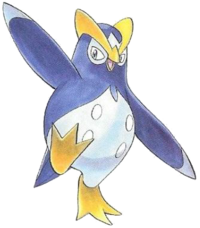 Prinplup makes a brief appearance after Hareta's Piplup evolves after its Everstone is removed. It then quickly evolves into Empoleon. Pottaishi is a combination of ?????? pochapocha (splashing in water or having a plump appearance) and ??? kotaishi (crown prince).